MSV: Sign of the Times: BLOWOUT! Sign of the Times: BLOWOUT! Tonight the kickoff event for City Council President Jen Giattino who is running for Hoboken mayor was held at Moran's and a blowout overflowing crowd beyond capacity forced 125 who blew through the event to the sidewalk outside causing much rubbernecking by the cars on midtown Garden Street. Among the luminaries: Councilman Dave Mello, Council candidate Kurt Gardiner, Parking Director John Morgan, Hoboken Zoning Board Chair Jim Aibel, Hoboken Housing Authority Chair David Dening, former HHA Chair Dana Wefer, former Hoboken Business Administrator Quentin Wiest, former council members Carol Marsh, Michael Lenz, former BoE trustee Theresa Minutillo, hospital authority board member and bonafide Hoboken heroine Toni Tomarazzo and council members Peter Cunningham and Tiffanie Fisher amid a buzzing throng. Did a Horse miss anyone? No doubt. There were MSV Premium readers, some never met before and other readers among the throng who kept asking, "Are you the Horse?" 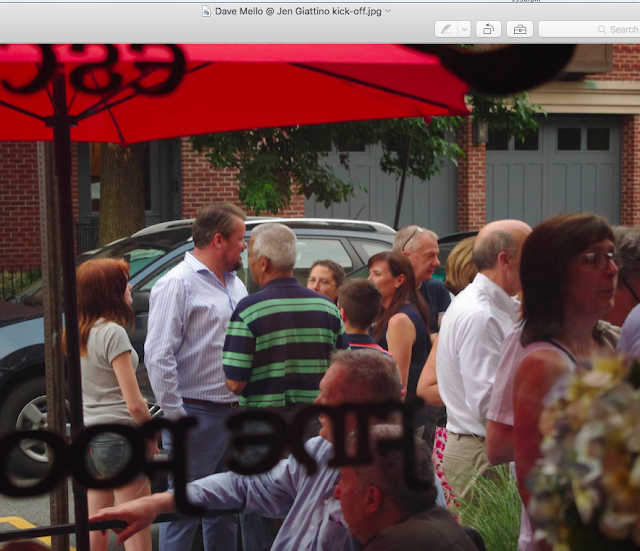 Councilman Dave Mello (l) among a group of the overflowing crowd at Moran's earlier this evening with City Council President Jen Giattino and friends. Former councilwoman Carol Marsh is seen (r) and NHSA commissioner and independent council candidate Kurt Gardiner (seated front). Grist for the Mill: Rebirth of Reform?